This bill defines the elements of a transition plan, including the most basic expectations like a portfolio of documents that includes current transcripts and results of academic assessments. Conveniently, this bill aligns perfectly with the federal Every Student Succeeds Act (ESSA), which now requires states to provide transition plans that assist students moving from correctional facilities to locally operated schools. Good morning Senators, my name is Hailly Korman. I’m a civil rights attorney at Bellwether Education Partners, and I work with public education and justice agencies across the country to improve the ways that they meet the education needs of students involved in the justice system. I was a member of the state’s education transitions workgroup, L.A. County’s probation workgroup, and the Camp Kilpatrick redesign team. I’ve worked with nearly 20 states and visited schools in secure facilities across the country. When I ask young people in those schools to share with me the last time they remember going to school every day, the answer is almost always fifth or sixth grade. Before being incarcerated, many of these students have not attended school regularly for three to five years, but reentry is an inflection point, and the better prepared they are when they leave a secure facility, the more likely they are to be accepted, welcomed, and supported by a receiving school. For many of our students, their transition from a juvenile court school back to their community will be their last best chance to move forward on a trajectory towards productive civil, social, and workforce participation. 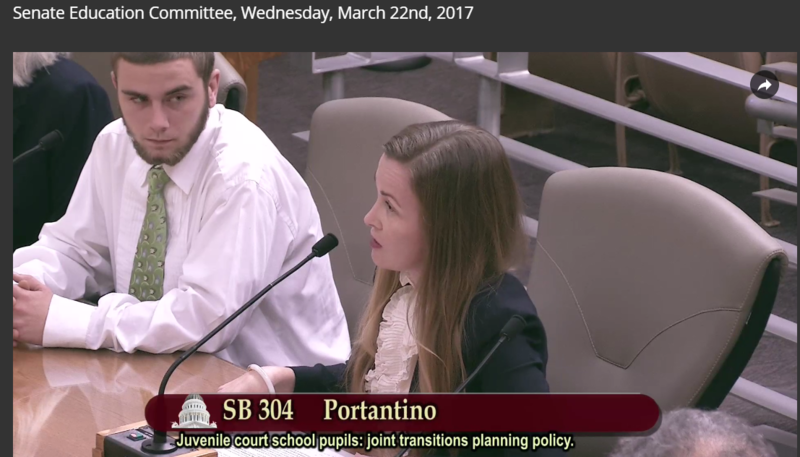 Returning to a community-based school with a full record of necessary basic educational information, as SB 304 would provide through the individualized transition plan, not only facilitates the correct placement in credit-bearing coursework and the provision of all appropriate special education supports, it also empowers that young person to begin to become an advocate for their own bright future. Researchers estimate that upwards of 60 percent of young people who are incarcerated will never successfully return to school. Reentry is a crucial moment in a young person’s life when they are vulnerable to losing essential course credits or dropping out entirely. Despite that, we still see astonishing variance in policies and practices across the state: some counties are making remarkable efforts to ensure continuity of care and warm hand-offs. 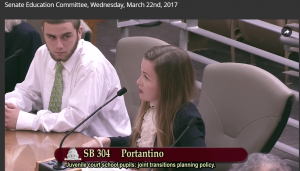 However the statutory clarity that SB 304 provides will support statewide progress and help to ensure that all students are prepared to return to their communities as full participants. During my testimony, I was joined by a young man who was both in the foster care system and the juvenile justice system. In addition to working two jobs (one of which is in youth advocacy), he now attends a community college taking the classes he’ll need to pursue his contractor’s license. This young man struggled mightily to make his way through the complex web of systems we expected him to navigate alone. I hope that other students get more support and that we move towards the day where his story is a common one, not an exception.